In the Orthodox Church the holy Martyrs and holy Ascetics are projected to be imitated, especially the Mother of God and Ever-Virgin Mary, who is mainly a Virgin and a Pure Mother. Mary is the unique person in which the virtues of Virginity and Motherhood are joined together. For, the Mother of God and Ever-Virgin Mary, is the only one amongst all women who was truly the Mother of the Son of God, according to His humanity, but simultaneously a true Virgin who preserved the purity of her soul, mind and body, before the birth, during the birth and after the birth of the Son of God. 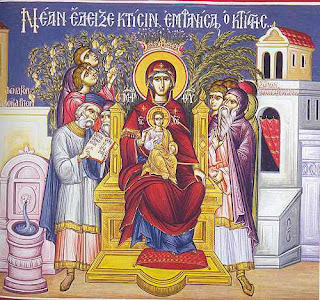 The Mother of God and Ever-Virgin Mary, is proclaimed by the Orthodox Church to be a Virgin before the birth of the God-man, at the time of the birth and after the birth, remaining a Virgin for all times. Because, He Who was born of her was not merely a man, but the Son and Word of God, Who took up upon Himself all of human nature to save man. For this reason “the Creator of heaven and earth” chose her before all ages, and in time He was incarnated within her “womb” to proclaim her to be the “pillar of virginity” and the prototype of all women of all and every generations. The holiness of the Mother of God and Ever-Virgin Mary is beyond any intellectual understanding. Which language can glorify worthily the virtues of her whose holiness surpasses Heaven and all Angelic Hosts? Thus, the hymn-writers of our Church in their attempt to find the proper words conclude, that every “hymn is defeated” and unable to find “equivalent odes” to offer to her who proved to be higher than the heavens. In the contemporary darkness of immorality, the reign of carnal sins, the annihilation of virtues, the unfaithfulness of husbands and wives, the apostasy from our Holy God, the Mother of God and Ever-Virgin Mary consists of the hope of the faithful, whom she “guides towards divine knowledge”. Seeing her example of life and virtues, all those who seek their salvation from the guilt of sin and desire their salvation from eternal death, turn to her, for they know that she is the “multi-flowing river” of divine gifts by which Christ our God, “Who redeemed all men”, tore the “manuscript” of our “ancient debts”. The obedience of the Mother of God and Ever-Virgin Mary became the medicine which healed the disobedience of Eve and granted new life to mankind. The humbleness and all-virtuous life of the Mother of God and Ever-Virgin Mary became the reason by which they shined, those who were in the darkness of not knowing God and His Divine Will. Today, we live in times where the virtues are mocked, piety is laugh at, the fear of God is considered as backwardness, and generally speaking every moral principle and value is scorned by the world which lives far away from God. We live in times where the black is presented as white, the truth as lies, the sinful life as something to be proud of and virtue as something to be ashamed of. The just is persecuted, the honest is punished, the truthful is hated, the fornicators and adulterers are praised; the thieves rule, those who sell drugs spread death, those who worship idols and Satan and those who commit abortion increase rapidly. On the contrary, if a young man or woman wishes to dedicate themselves to God, to follow the monastic way of life, then, everyone rises against them. All these things take place because we have departed from God. In our homes, instead of having Holy Scripture and the Catechesis, TV and all worldly songs prevail. Many women have left their husbands and children, and many men abandoned their homes in seeking lawless relationships outside their marriage and in night clubs and sinful places of darkness. This they do in the name of modern life. But, far away from Christ there is no morality, there is no happiness, no peace, no calmness of the soul. Far away from Christ no one can achieve anything. Without Christ, no one can be saved, nor can they be sanctified. In the multi-waved sea of this life, let us turn our attention towards the Mother of God and Ever-Virgin Mary. She is the hope of all those who are hopeless. She is the protecting “Wall” of all those who desire to live a pure life of virginity, but also she is for those who turn to her and beseech her to deliver them from ever disaster and especially from the eternal fire. We are going through the fourth week of Great Lent. It is never too late to cleanse ourselves of our sins in the Holy Sacrament of Confession and Repentance. Christ is waiting to wipe our tears, to vest us with clean vestments, to embrace us as a loving Father. Let us take advantage of the situation, let us make good use of our time and let us run to the Merciful God and ask for His forgiveness. Thus, with a clean conscience we will chant worthily to the Mother of God, “Rejoice, O Bride unwedded”.